Issue three of our newsletter takes a look at online security and the ways you can protect yourself online. We also have our handy savings tips as well as Smart Money, Paul Whitlock's latest blog. Top saving tip - could YouTube be the key to saving you Money? It’s that time of year when we start to think about getting round to all those DIY jobs we conveniently put off until it was warmer and dryer. On the plus side, doing things yourself has the added benefit of giving your finances a rest. I know it’s easy to dismiss and maybe, like me, you’re one of those people who don’t like or simply can’t do certain things for themselves, but wherever possible it can be advantageous to do the smaller tasks ourselves. Handing over £20 here and £30 there in return for someone mowing the lawn, ironing your clothes, cleaning your windows, or washing your car may not seem much on an individual basis but it soon adds up. If there’s a ‘big’ task that you think might be beyond your capability then consider that the best instructor is free and available 24 hours a day, 7 days a week…even Christmas Day. YouTube could save you lots of money on expensive call-outs thanks to plumbers, carpenters and all manner of tradespeople uploading videos showing how to stop taps from dripping or doors from creaking. And you can do this at a time that’s convenient for you, and you definitely won’t charge yourself a call-out fee for what turns out to be a simple fix. Finally, you’ll have a tremendous sense of achievement and a certain satisfaction that money can’t buy. Today marks the first birthday for Charter Savings Bank, a big thank you to all our customers who have supported us in our first year. Charter Court Financial Services (CCFS) which is based in Wolverhampton has been ranked tenth in The Sunday Times Best 100 Companies to Work For 2016. The firm employs over 350 people at its headquarters in Wolverhampton Business Park and owns Charter Savings Bank, one of the UK’s leading challenger banks with over 40,000 savings accounts and balances in excess of £1.7billion since its launch in March 2015. Over the past eight years CCFS has experienced unprecedented growth, and is a significant employer in the area. Since 2008 the workforce has grown from just 20 employees to 362. 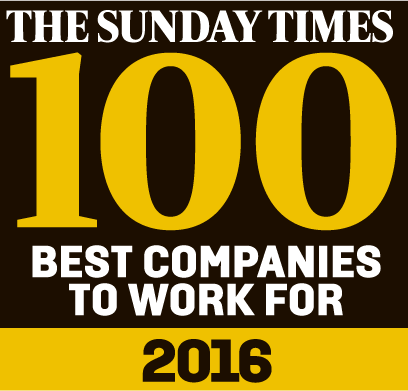 The Sunday Times Best Companies to Work is a highly prestigious award which champions the importance of maintaining a happy and motivated workforce in successful high growth businesses. As mortgage borrowers across the UK breathed a sigh of relief, savers took yet another blow last month with the Bank of England announcing that interest rates are to remain unchanged with a future rate rise looking unlikely any time soon. For over six years, UK savers have been trapped in a low interest rate environment, struggling to achieve any notable returns on their nest eggs – especially those with savings languishing in high street accounts paying paltry rates of interest. Indeed, our recent research found that more than a fifth of UK adults are earning interest of 0.50% or less on their primary savings account. The level of people’s disappointment at the Bank of England’s latest guidance was perhaps inevitable, especially when you consider that just 4 months ago it was Carney’s view that rates could rise as early as the end of this year. Following this latest postponement, however, the Governor has now been dubbed in some quarters as ‘the unreliable boyfriend’ or ‘the boy who cried wolf’. There are a plethora of factors which influence the UK’s interest rate, and while the continuing growth of house prices initially made a rate hike appear more likely, ultimately volatility in the global financial markets and low inflation have prompted the Bank of England to err on the side of caution once more. All eyes now turn to the US, where savers have been battling against a base rate of 0.25%. Just a couple of months ago, it looked like there would be a race for which major central bank would be first to increase rates. But with this latest deferment from the Bank of England– not to mention the European Central Bank suggesting they were prepared to cut rates – it appears the US Federal Reserve is now likely to be first out of the blocks in the interest rate race. It’s not all doom and gloom for savers in the current environment though. Low inflation means things like doing the weekly shop, putting petrol in our cars and even stocking up for Christmas can all cost less, which all adds up to having more money in our pockets and so we should all be able to spare a little more every month for our savings. And if most savers are only getting rock-bottom rates offered by the mainstream providers, then many may feel compelled to hunt out the better deals that are available. Indeed, the low interest environment has magnified the benefits of increased competition from challenger banks, like Charter Savings Bank, and this increase of competition can only be a good thing for savers. New research from challenger bank, Charter Savings Bank, conducted in conjunction with YouGov, has found that more than an eighth (13%) of UK adults with savings are earning below 0.5% interest on their primary savings account, which is less than the base rate set by the Bank of England. The research shows that as a result of historically low interest rates, combined with poor High Street offerings, the average UK savings pot, now £8,500, could earn just £43 a year of annual interest. These ‘modern day mattress savers’ are earning only slightly more in interest than the 174,000 UK adults who keep their savings in an unsecured place, such as under real mattresses or in shoe boxes. To give an idea of the scale, the Bank of England recently estimated that the UK homes have £3billion of cash stashed away. The research also reveals that whilst saving is a habit for the UK, many are simply not engaging with their hard-earned money: nearly a third (32%) of UK adults with savings admitted they do not know the current rate of interest on their main savings account, while a fifth (17%) admit to having never checked the rate on their primary savings account. “Whilst it is encouraging to see that saving has become a habit for so many of us, more needs to be done to ensure consumers know there are ways they can make their savings go further. The low interest rate environment over the last six years has opened up the opportunity for challenger banks – such as Charter Savings Bank, One Savings Bank, Aldermore and Shawbrook Bank – to offer the only viable alternative for savers’ money. Currently, challenger banks dominate the best buy tables and pay interest rates that top 2%. With this in mind, some savers could be earning more than four times as much interest as they currently do.